I finished soldering my other two stepper motor controller boards last night. I have yet to start making the extruder. The addition of these two boards completes all but the extruder assembly. I decided to follow Nophead's lead and rig a pen to the X bracket mount with a bit of capa. The first thing I did was write up some firmware to draw squares. I wanted to test out the precision of my pulleys, stepper motors, and rig. I continued this work tonight and was very excited with the result. I started off tonight by drawing a 1000 step by 1000 step square and measuring it. It turned out to be 81mm wide / tall. This means that I am getting a higher resolution than expected! I should be able to print parts to a 0.081mm resolution! Wow! Next I decided to show off and write a short script to scribe with my repstrap. 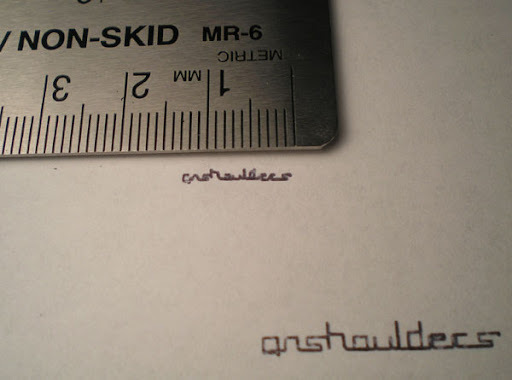 Here is a picture of "onshoulders" being written at 13mm and 25mm. I am using a BIC pen I got at a Marriott... so a better pen would obviously give a better result. And here is a video of my repstrap in scribe action. I brought up the size to 100mm so that the motions would show up better on camera. onshoulders, written by a repstrap from gavilan on Vimeo. Now I need to draw my attention to the Z axis and see if I can rig up some tests for it. Then it's build time for an extruder, and I still need to pick up some HDPE.